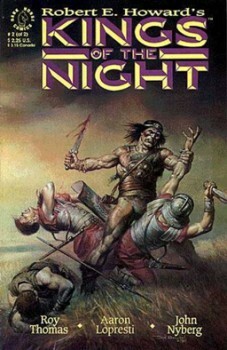 We are trying to look at as broad a range of topics related to Robert E. Howard as we can in this series. Characters, genres, events, themes: Black Gate really wants to showcase the many facets of the man and his works. Today’s guest post is such an example. Jeff Shanks wrote the introduction to the just published facsimile edition of Howard’s essay, The Hyborian Age and is the REH consultant on Modiphius’ upcoming Conan RPG (we’re gonna have a post for that, too!). I can’t think of anyone better to write about one of my favorite subjects, world-building. While Robert E. Howard is known as the creator of a number of memorable heroic protagonists, such as Kull of Atlantis, Solomon Kane, Bran Mak Morn, and, of course, Conan the Cimmerian, his efforts as a pioneer in fantasy world-building are often overlooked. When it is remarked upon at all, Howard’s creation of the Hyborian Age of Conan is generally described as a fairly impromptu effort — a hodge-podge of fictitious kingdoms based on thinly-disguised real world historical analogues, thrown together hastily in early 1932 after the first Conan story was accepted by Weird Tales. But in recent years, research by Patrice Louinet, Rusty Burke, and this writer have shown that Howard put a great deal of effort into constructing his fictional prehistoric world and it was a far-more complex and intricate affair than has been previously acknowledged. In fact, the Hyborian Age was only one part of a larger, fictional, shared universe that Howard constructed and developed over almost the entirety of his career. Shared universes are taken for granted today, but they were a novel idea when Howard was writing. That his major characters occupied the same continuity is most explicitly demonstrated by the crossover story “Kings of the Night” which features both Kull and Bran Mak Morn. Likewise the Conan story “Tower of the Elephant” references several of the kingdoms from the earlier age of Kull. Even the Elizabethan-period Solomon Kane visits a ruined remnant of Atlantis in Africa where the names of gods from the Kull stories are used. Additionally, numerous references to elements from the works of H. P. Lovecraft and Clark Ashton Smith tie in (at least loosely) Howard’s stories with the greater Cthulhu Mythos universe. So while the terms “world-building” and “subcreation” didn’t exist in Howard’s day, it’s clear that was exactly what he was trying to do. When most people think of Howard’s world-building, the essay “The Hyborian Age” is usually the first thing that comes to mind. This extensive fictional history of the setting of the Conan stories, written in early 1932, was never intended to be published — it was merely a background reference for Howard himself. And yet, the essay went through multiple drafts — clearly Howard put a lot of work into this essay to flesh out the world of Conan. 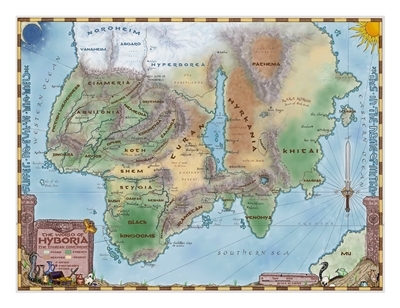 He also created two maps of the Hyborian kingdoms, a task that few authors before him had done, but one that has now become a necessity for modern fantasy writers. Over the next few years, the Hyborian Age evolved as Howard added more backstory and fleshed out the world. The essay places the Hyborian Age at the end of the last ice age, after a great cataclysm that destroyed Atlantis, Lemuria, and the Pictish Isles. Survivors of the cataclysm migrate to the mainland of prehistoric Eurasia and, along with other groups of humans, eventually rise up from savagery and build civilizations some as advanced as medieval Europe. This was the Hyborian Age of Conan. But after only a few thousand years the Hyborian kingdoms fell, overrun by savage tribes of Picts on the west, the mailed riders of Turan from the eastern steppes, and finally the barbarian Norheimer from the north. Another series of geological upheavals took place and a last period of glaciation completed the ruin — the Hyborian Age was lost to history, remembered only with a few half-forgotten names that survive in myth and legend. But the basic framework of this “history” of the Hyborian Age had actually been around since the beginning of Howard’s career in the early 1920s. Starting with stories of cavemen and references to lost continents, Howard slowly began creating what would become a fantasy version of the prehistoric world. With the Bran Mak Morn story, “Men of the Shadows,” written in early 1926, the prototype for what would become the Hyborian Age first appeared. In the story a Pictish shaman tells the history of four “Races of Man” — the Picts, the Atlanteans, the Lemurians, and the Celts – from the dawn of history up to the Roman Empire. In this tale, the Picts and Atlanteans migrate to mainland Europe after a cataclysm, then the Celts (or Nordics in one draft) sweep down from the North — an early version of what would become the history of the Hyborian Age six years later. After “Men of the Shadows,” much of Howard’s weird historical and sword and sorcery fiction can be seen as narrating the stories of these four “races” through time, as they rise and fall technologically, evolve and devolve physically, and interact with each other — sometimes fighting, sometimes breeding, but always struggling and striving to survive in a harsh, brutal world. The stories of these Races of Man, became the framework, the nexus upon which Howard’s world-building takes place. Because of this I tend to describe it as “anthropological world-building,” referring to the now discredited racialist anthropology of the late 19th and early 20th centuries. In those days the fledgling discipline of anthropology was obsessed with the classification of humans into racial categories based on junk-science like head shapes and other morphological features. Howard was very much influenced by these ideas — even to the point of creating his own fictional “races” like the Hyborians. Howard built his fictional prehistory on the foundation of anthropology and race, just as Tolkien built his fictional world on the foundation of philology and languages. Not long after “Men of the Shadows,” Howard began writing stories about the pre-cataclysmic Thurian Age of Kull of Atlantis. These stories are set in the early part of the prehistory outlined in “Men of the Shadows.” The Picts, Lemurians, and Atlanteans are the barbarian races during the Thurian Age, still living on their islands. A prehistoric version of the Celts even appears in one unpublished Kull fragment. In the early 1930s, after discussing some fringe anthropological ideas with Lovecraft, Howard turned his attention to the Neolithic, Bronze, and Iron Ages in a series of “Little People” stories: “Children of the Night,” “People of the Dark,” and the classic Bran Mak Morn yarn, “Worms of the Earth.” In these we are able follow several of Howard’s Races of Man from the end of the Ice Age up to Roman times. The Neolithic Picts, now equated with the so-called Mediterranean race, have settled mainland Europe and moved into Britain, while survivors of Lemuria had become the Asian or Turanian race. When waves of short-statured Turanians migrate into Neolithic Europe they come into conflict with the Picts and the former are eventually defeated and nearly exterminated, the survivors driven underground and into caves. There, these Turanians — descendants of the Lemurians — devolve into hideous reptilian creatures and become the source of the Little People of folklore. Later a new wave of people sweeps into Europe: Howard’s fourth race, the Celts (or Aryans). They push out the Picts to the fringes and usher in the Bronze Age in Europe. 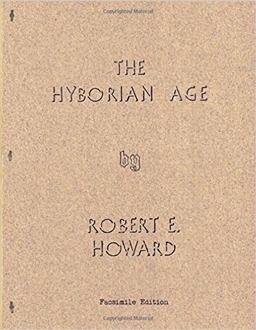 When Howard created the Hyborian Age in 1932, he placed it after the Thurian Age of Kull, but immediately before the Neolithic and Bronze Age “Little People” stories. Following the Great Cataclysm the Atlantean survivors became the Cimmerians in the Hyborian Age; the Picts on the mainland became the Hyborian Picts of the Conan stories; the Lemurian survivors became the Hyrkanians and Khitans of the Hyborian Age; and the newly-evolved Nordheimer in the Conan stories would become the later Aryans. This explains why Howard had the Hyborian Age come to an end the way it did, with the Picts overrunning much of Europe from the west, the Turanians moving in from the east, and the Norheimer/Aryans poised to sweep down from the north — he had to set the stage for the Neolithic/Bronze Age race wars that he had just described a few years earlier in the Little People stories. So when one takes a macroscopic look at Howard’s weird yarns, what you see is a vast fictional history that encompasses tens of thousands of years and tells the stories of several groups of humanity and their great journeys throughout that immense span of time. His different character series — Kull, Conan, Bran Mak Morn, and others — focus on various epochs in that greater chronology and each builds on the next as Howard’s fictional universe evolved and coalesced over the span of his career into something greater than the sum of its parts. This was early world-building on a much grander scale than has been previously acknowledged, and it is one of the primary reasons that Howard should be considered one of the great pioneers of modern fantasy fiction. 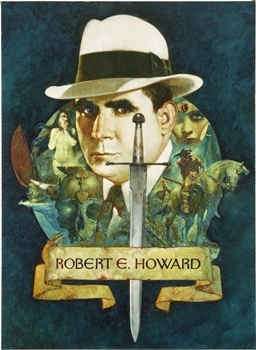 Our summer of Robert E. Howard is far from over! Jeffrey Shanks is an archaeologist and popular culture historian and has authored a number of popular and scholarly articles on Robert E. Howard. He currently serves as co-chair of the Pulp Studies area of the Popular Culture Association and has received the REH Foundation Award for Best Print Essay three years in a row. He is the editor of Zombies from the Pulps! and co-editor of the forthcoming academic essay collection The Unique Legacy of Weird Tales: The Evolution of Modern Fantasy and Horror. My favorite part of RPGing was world building. Great stuff. It also bears mentioning that REH wasn’t alone in this kind of content generation; a number of his letters with H. P. Lovecraft discuss the kind of “anthropological worldbuilding,” and the two authors influenced each other a bit in their different approaches to the subject. Where Lovecraft had his “History of the Necronomicon,” Howard had his “The Hyborian Age,” and both proved highly influential on subsequent authors and how they conceived and built their own fictional worlds. Good read to go with this post, and there are some good comments, including one from Mr. Shanks. Howard’s Hyborian Age was a primary influence on Tom Moldvay and myself when we were devising the Original Known World campaign setting for D&D in the mid-1970s. We were past the era of junk-science racialist anthropology, but the idea of basing the OKW’s cultures on more-or-less thinly veiled versions of real historical cultures was key for us, as we felt that would give game masters a way to flesh out their game worlds by using historical references.